Released in 1909 by Rider, this deck became popularly known as the Rider-Waite , despite the fact that the cards were actually created by Pamela Colman-Smith. Back in the day, it was not commonplace for a commissioned artist to be credited for their work. Modern readers commonly refer to this deck as the Rider-Waite-Smith Tarot today, in honor of the deck’s artist, who unfairly got the shaft (and to make matters worse, did not even get paid). 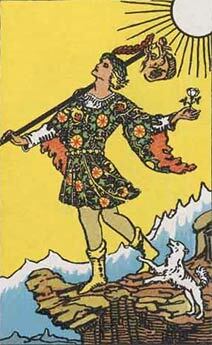 The RWS Tarot is unquestionably the most popular and influential deck in history. In fact, most people consider this one not to be merely a Tarot, but the Tarot. The reason for this is simple. The vast majority of readers begin by learning this deck, which naturally creates a sense of sentimentality. A.E. Waite apparently designed this deck to sell out occult secrets of the Esoteric Order of the Golden Dawn, which he headed for a time, and to make tarot accessible a priori – to any lay person who lacked the discipline to go through proper channels. Before the RWS, occult initiates were privileged to know the Tarot’s secret esoteric role as a tool of divination. Waite decided to revolutionize the Tarot by removing the pip cards — in favor of picture cards showing easily interpreted scenes, like comic strips telling a story. Pip cards containing occult symbolism require far too much study for impatient, lazy beginners who just can’t wait to get it on. Waite made it as easy as possible for anyone to pick up and learn quickly without the need for anything more than a thin handbook. Unfortunately the price of hitting the lowest common denominator for the sake of quantity — is the sacrifice of quality. Waite also removed the Golden Dawn method of interpreting the cards with regards to elemental dignities, another thing that required much too much practice for beginners to learn quickly. Black and white may be easy for all to see, but it takes a lot of willpower to develop an eye for detail in order to appreciate subtle nuances of gray, and then individually move to the colors. A.E. Waite chose to make things as easy as possible, adopting the old Etteilla method of reversals in place of elemental dignities, effectively switching the dignity-interpretation of cards from manual to automatic. Like Miss Cleo, Waite clearly did everything he could to make Tarot accessible to the masses. The vast majority of modern Tarot decks have been made in the vein of the RWS style, including the Diary of a Broken Soul by Ash Abdullah. In fact, 4 out of 5 decks on this site pay tribute to Waite’s deck, and even most hardened occultist has to admit that we all owe a debt of gratitude to Waite in one way or another. If no deck had done what the RWS did, the Tarot might still be relegated to occult obscurity today.